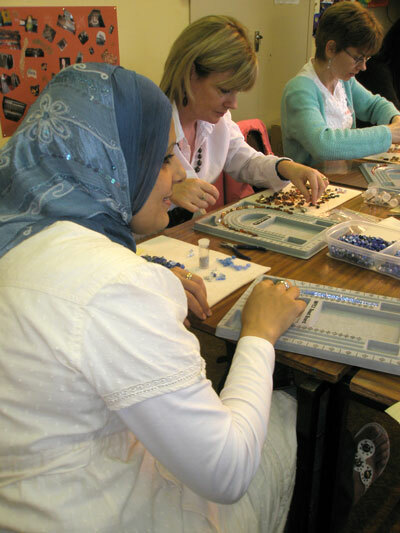 Great fun was had by all at a jewellery workshop in the MIA centre on Wednesday 13 August last. People came together from all different backgrounds and nationalities to participate in this creative workshop. There was a wide range of beautiful beads of all shapes and sizes and colours and ideas and inspirations were flowing. Everyone created their own piece of jewellery such as necklaces, bracelets and ear rings and was proud of their beautiful creations. Suzie Sullivan of Derryaun Crafts, Drummin, Westport facilitated the workshop. Everyone went away proud and happy wearing their own creations at the end of the day. If you want to find out more about upcoming projects in Mayo Intercultural Action, please contact MIA at 094 904 4511 or miamayo@eircom.net. Or why not drop in to our offices in the Social Services Centre, Castle St. Car Park (behind Archway Stores), Castlebar to say hello.